The Lumad Leaders have spoken exposing the truth about the propaganda and lies allegedly being spread by Bayan Muna and ACT-Teachers partylist in the controversial issue involving the rescue of minors in Talaingod, Davao del Norte. 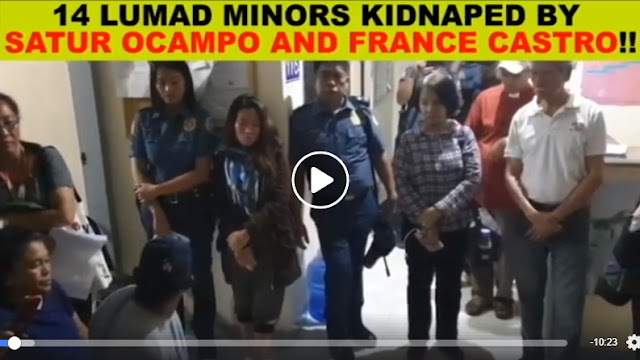 Former congressman Satur Ocampo and Rep. France Castro were apprehended and detained by the Talaingod Police Station operatives for their alleged "illegal transportation of minors" activities in Mindanao. Aside from Satur Ocampo and Rep. Castro, there were 70 church workers, teachers and Lumad students who were detained in a police station in Davao del Norte. Ocampoo and Castro claimed that they were just doing their jobs of rescuing the Lumad students with whom they noted also that were seeking help from them. The claims made by Ocampo and Castro were countered by the Lumad leaders as they shared the truth regarding the alleged abduction and not the rescue operation as what Castro's camp claimed in various news report with the mainstream media. According to the Lumad leaders it is not the military who killed some of their datus and prominent leaders but the NGO's like the Bayan Muna and ACT-Teachers partylist who started the troubles on their ancestral domains. Since the time when the NGO's entered the area, they experienced harrassment. The Lumad leaders also claimed that they lived peacefully on their areas but after the arrival of the groups like Bayan Muna and ACT-Teachers, they were being used to be at the forefront of the war between the NPA and the government forces which only showed that the groups of Castro had no respect with the ancestral domains of the Lumads.